Cromwells Hideaway07949201834work Alternative AccommodationHi we are Karen and Dave and we would like to welcome you to Cromwell’s Hideaway, it is our piece of luxury hiding away in the picturesque Monmouthshire countryside. It’s the perfect place to get away from the hustle and bustle of city life and relax in the great Welsh outdoors. Perfectly nestled with breathtaking views of Raglan Castle and the Brecon Beacons. 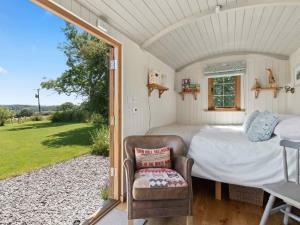 It is an historic place so that is why we chose a Shepherd’s Hut surrounded by farmland, it combines heritage with luxury. You can expect a secluded romantic hideaway location, with ensuite facilities, country kitchen, full size double bed, underfloor heating and log burner to keep you warm on those chilly winter nights. Perfect for outdoor eating and stargazing at night. Hi we are Karen and Dave and we would like to welcome you to Cromwell’s Hideaway, it is our piece of luxury hiding away in the picturesque Monmouthshire countryside. It’s the perfect place to get away from the hustle and bustle of city life and relax in the great Welsh outdoors. Perfectly nestled with breathtaking views of Raglan Castle and the Brecon Beacons. The gentle bar from the lambs during the day and the hoots from an owl at night will ensure pure relaxation. Perfect for walking or visiting local castles or the market towns of Monmouth and Abergavenny, or if you want more of an adventure try canoeing or kayaking on the river Wye. Plenty of Country Pubs and excellent Restaurants to choose from you are spoilt for choice.